I apologize for all of the CHAOS Brew Club posts as of late. We are just putting on some great events recently! 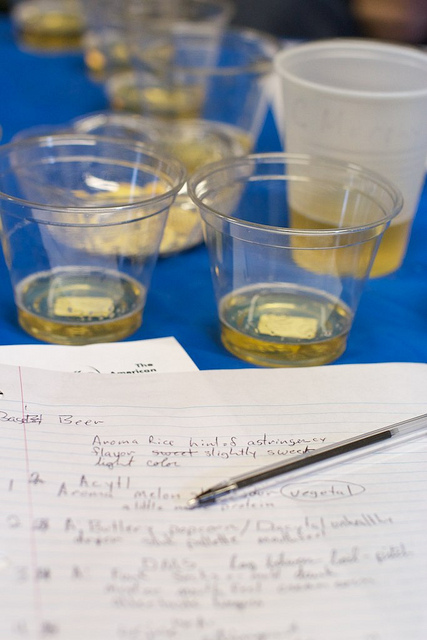 Like on Saturday, February 18th where one of our members arranged for Marty Nachel, one of the first Beer Judge Certification Program (BJCP) judges and author of Homebrewing for Dummies, to come to the community brewhouse and teach a beer sensory class. I have been wanting to take a class like this for a while and immediately signed the hubby and myself up when it was first advertised on the CHAOS website. Due to the nice day and mild temperatures, the hubby and I decided to ride our bikes down to the brewhouse. We arrived right on time, just as Marty was introducing himself. He went over his credentials and experience, and then gave us an overview of what we would be doing in the class. He then opened the floor up for questions before we got started. 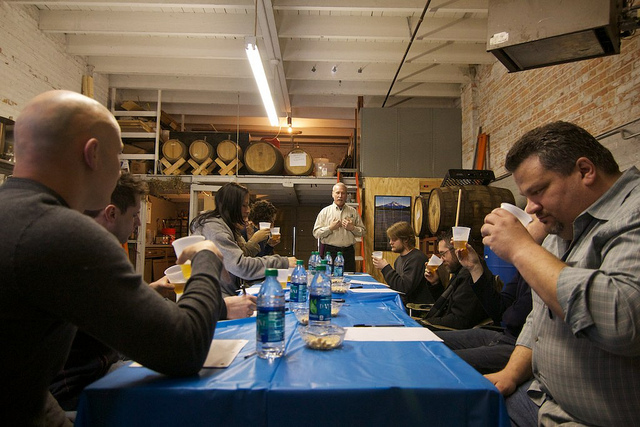 One participant asked whether we should swallow beer at a tasting or spit it out a la wine tasting. 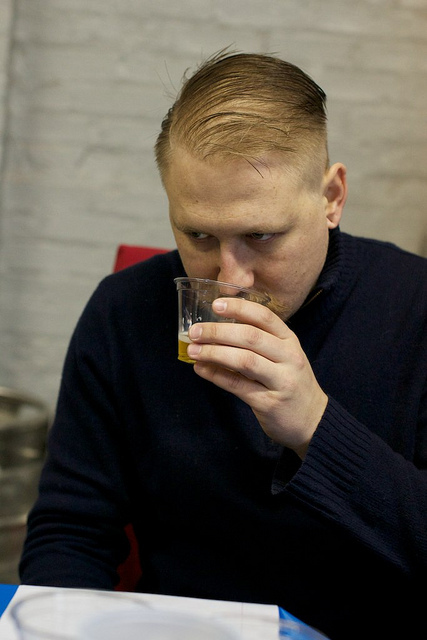 Nachel instructed that you should definitely swallow during a beer tasting. “We don’t need to be like wine drinkers,” said Nachel. Many of us aspire to be BJCP judges and CHAOS member Daniel Barker asked how we should approach the exam. Nachel said that it is of utmost importance to know your styles. The best way to study, according to Nachel, is to start having roundtables where we all drink someone’s homebrew and discuss what we each taste. Also, the BJCP guidelines provide commercial examples of certain styles. He suggested that we taste those examples to know what the BJCP considers the best embodiment of a style. CHAOS member Jim Chochola asked Nachel if he can ever just sit back and enjoy a beer. Nachel replied that he is always in judge mode, always picking up nuances of the beer he is drinking. I don’t know if I would enjoy that. I like having a naive approach to beer. I know I don’t always use the “correct” terms to describe beer but that’s my interpretation, what it means to me. And isn’t that what beer should be about? I’m not saying that there shouldn’t be competitions. And I have toyed with the idea of studying and taking the BJCP exam. I just don’t want to get to the point where I lose that wonder and excitement when I take a sip of a truly fantastic beer. After the brief question and answer period, it was time to get the class started. First Nachel poured us all a base beer, the canvas on which all of the impurities would be added. He stressed that it was not important to know what the base beer was; he did not want us to be preoccupied with or place judgement on a certain brand. We were instructed to just pay attention to smell and taste, and not to be affected by color, sound. We first needed to be familiar with the base beer, so we drank and wrote down our impressions on the blank piece of paper that was provided. This exercise would help us know what is wrong later on. 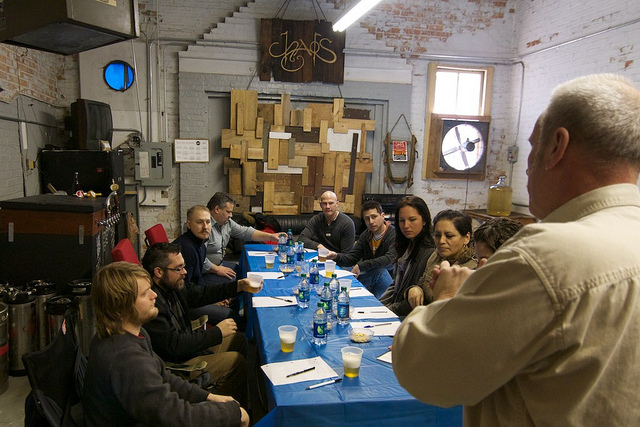 As we were drinking the base beer, Nachel gave us an overview of beer flavors and the intricacies of the human palate. 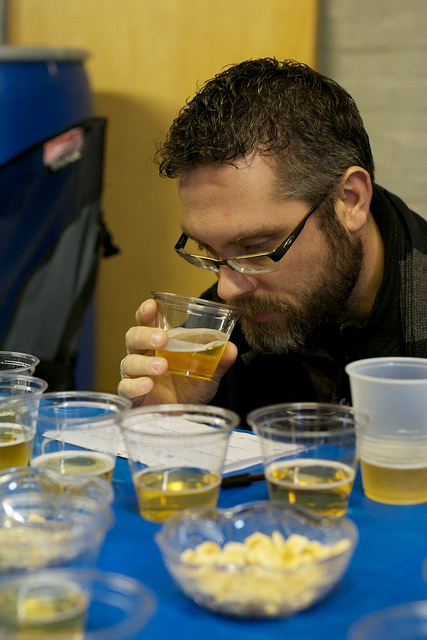 Apparently the palate is most sensitive mid-morning so the majority of beer judging occurs during this time. Also, typically, women have a more fine-tuned palate. Go us! He also went over how each person is different so it is important to know your tasting weaknesses and be able to work around it. When judging, Nachel said, you always have a partner that can assist you and confirm/deny your taste; you help each other out. Nachel showed us how to access your retronasal passage by taking in a breath, swallow, and then breathe out your nose. This allows you to access even more knowledge about the beer you are tasting, and stresses the importance of swallowing during a beer tasting. Nachel also stressed the importance of mouthfeel and how sometimes it is often not noticed for what it is. I noticed that I do this. I always thought mouthfeel was specific to the body of the beer. While this is true, it also refers to temperature; it is anything that you can detect (“feel”) in your mouth. After this tutorial it was time to start tasting the doctored beers. As Nachel was handing them out, we were instructed to keep our thoughts to ourselves as we were trying the doctored beers so as to avoid influencing others. The first off flavor we tried was Acetaldehyde which is brought on by certain yeast strains and is more prevalent in lagers. It occurs when fermentation is stopped abruptly, when you end fermentation without allowing it to complete. You should pick out a green apple aroma and flavor. I, however, thought it smelled like NyQuil; I got an imitation cherry aroma and flavor. I guess I should be proud of myself that I at least got a fruit essence, but it did not come across as apple to me until someone suggested it. CHAOS member Jim Cochola smells a doctored beer. The second off flavor was diacetyl which is an indication of an unhealthy fermentation and surfaces as a buttery popcorn or butterscotch flavor in beer. It is also apparent in a slickness or oily mouthfeel. Some diacetyl is allowed, although never in lagers. I was surprised; this is the infection that I am most familiar with, in that I actually know the name. But I did not detect this at all. My hubby apparently is very sensitive to this off-flavor as he took one whiff and knew exactly what it was. The fourth doctored beer contained isoamyl acetate which imparts a banana flavor. This flavor is allowed in certain Belgian and German styles; I’m sure you’ve had a hefeweizen that has a strong banana essence. It is caused by the yeast and is a biproduct of fermentation. It is an indicator of poor yeast health. I didn’t get this at all from the sample. The fifth doctored beer was everyone’s favorite. And I am being very sarcastic. Before you even put your nose to the glass you could get a whiff of this treated paper or cardboard smell. This was caused by trans-2nonenol, or oxidation. Whenever you hear someone talk about a stale or “skunked” beer, this is what they are referring to and it occurs when the fermented beer is exposed to oxygen. You can aid in avoiding this in your beer by fully oxidizing the wort prior to pitching the yeast. The hubby and I use an aquarium pump, but there are other methods out there that assist the home brewer in introducing oxygen to unfermented beer. Nachel explained that certain beers, like barleywines, can have a fair amount of this and it is considered appropriate for the style. It will manifest itself as being cherry and fruity, which can accent that style nicely. The sixth and final doctored beer had a sour aroma and flavor. I picked this up right away as I have been trying to get more and more into sour beers. Believe it or not, the official term for this is “infected” and occurs when bacteria or other microorganisms are introduced to the beer. Brettanomyces is a popular infection right now that elicits a horse blanket aroma and flavor. After we sampled all of the doctored beers, Nachel led us through some exercises. We were all given a BJCP worksheet and then we tried to match the official taste descriptors to each of the beers. Then, in an effort to test our new smarts, Nachel had us mix up our cups so we didn’t know which doctored beer was which, and then we had to assign them to the appropriate label. This was a little unfair because everyone knew which one was the oxidized beer; it was the most full in everyone’s lineup since no one wanted to sip it! Overall, I did pretty well. I got four out of six matched correctly; I, for some reason kept getting diacetyl and isoamyl acetate mixed up. As we were getting ready to head out, my hubby pulled out a bottle of our supposed-to-be Scotch ale. Something happened to it during secondary fermentation and it just tastes off. We originally thought it was because we dry-hopped it with Saaz (don’t do that to a Scotch ale) but there is a funky, sour thing going on that makes me believe that there is an infection of some sort. Nachel agreed to let us know his thoughts. We poured him a glass and he stuck his nose in to get the full aroma. I felt bad for him; I’ve smelled this beer on numerous occasions and can’t stand it. He then took a sip and, to my surprise, said that he didn’t detect anything wrong with the beer. All he said was that if we were going to enter it into a competition (uh, we’re not) that we couldn’t put it in the Scotch ale category; it would have to be included as a sour ale. Wow. Was not expecting that. But good to know! This was a great class, and it really makes you think. I was expecting to be able to pick up more of the impurities than I did; I thought I had a pretty good palate. But this class allowed me to better understand my strengths and weaknesses so I know where I need to improve. There has been great interest in these classes so I am sure CHAOS will host them again. If you are interested, keep a look-out on the CHAOS website. 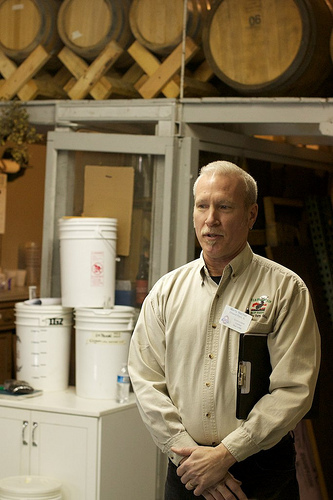 Or if your own homebrew club is interested in having Marty Nachel conduct a similar class, shoot him an email at aleconner@aol.com. This is a very good summary of the Basic Beer Sensory Class and I appreciate your posting it. You did a near perfect job of documenting everything, but in the interest of clarity, I feel I need to make two small corrections. 1). In discussing oxidation, particularly in regards to barleywines and other higher ABV beers, what I said was misinterpreted. Oxidation in the early stages is “papery”, in the advanced stages, it’s “cardboardy” and in the well-aged stage, it takes on “sherry” notes (not cherry). 2). While still discussing the staling of beer (oxidation), I never used the word “skunky” because it bears no relation to this off-aroma/flavor. Skunking in beer is altogether different from staling. The official term for a beer that gives off a skunky character is “lightstruck”; this is due to light –whether incandescent, florescent, or sunlight– affecting hop components in the beer. Where staling often takes weeks and sometimes months to manifest itself in beer, skunking can happen in mere minutes. Thanks Marty! I really appreciate you taking the time to clarify this! Cheers!